In July, while on a family flying vacation to Alaska, I took the opportunity to get a float plane rating. 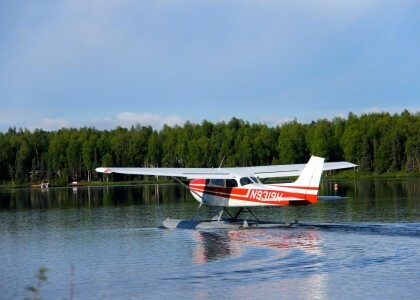 Alaska has thousands of float planes to take you into the many beautiful but secluded lakes they have. I located an instructor who was willing to help me get my rating in 3 days. Now, a float plane is not the most practical airplane for flying in North Texas (where I live) and I have no intention of purchasing a float plane. So why do it? Flying floats is all about good airmanship. Flying for the sheer fun of it was something new. I’m not a fly around the patch kind of pilot. 99% of my flying is to go somewhere and to do something. It had been a while since I had learned something really new in flying. The idea of learning something new and growing as a pilot was exciting. It was a great excuse to fly low and see the Alaska countryside from the left seat. I started by downloading the Sporty’s Video App: “So You Want to Fly Seaplanes” …the videos were extremely helpful in giving me a good overview of the basic concepts. I also downloaded an FAA ebook version on Seaplane Operations from Amazon. Honestly, I really wasn’t that worried about the flying part, but the water operations made me very nervous…no brakes, limited steering, all at the whim of the wind. I was fortunate because the plane I was going to fly was a Cessna 172 with a float plane kit. I have over 900 hours in 172’s, so getting familiar with the aircraft was fairly straightforward. Most of the familiarization was related to the floats themselves and reorienting myself back to an analog six-pack of instruments (no easy task coming from a G500). Once I got the plane started, we basically idle taxied in circles as I learned how to handle the aircraft with a healthy breeze blowing us around. Simple things that you take for granted on the ground, like a run-up and mag-check become a bit more interesting without the ability to have brakes. If I had to sum up the most important lesson learned, its that fighting the wind is futile. When you are on floats, you cannot really strong-arm the plane to your will. Instead, you have to leverage the wind and work with it…and a lot of time, you have to just give up and try something other method to get the plane to go where you want it to. My first take-off didn’t seem much different than a normal take-off…I still needed right rudder to off-set the propeller torque and rotate at the proper speed. BUT, once airborne, all bets where off! With those giant floats hanging down, the normal right rudder on climb-out was ALL WRONG! I looked down at the turn/slip indicator (the ball) and I needed LEFT rudder…not right! OK…so maybe I should have been more worried about the flying part! Navigation is something I always have supplemented with high-quality and numerous GPS devices. Even in my very first Cessna 172xp I had dual Garmin 430’s. Our Bonanza has a 750/650 stack and I supplement with Foreflight on my iPad mini. But here I am, sitting in the cockpit of a little 172 with the most reliable navigational aids being a compass and a window. I’m in unfamiliar territory, flying over unfamiliar landmarks, and the old trick of reading town names off of water towers was useless….there were no water towers! Fortunately, my instructor was cool with helping navigate me back to seaplane base. After the first lesson, I was careful to bring along my iPad with Foreflight so I could at least find my way home if I scared my instructor into a coma-like stupor. I’ve always been a fan of nicely paved runways and being from Texas, most of our lakes have tree stumps still sticking out. So water landings are not something I had considered as being a good time. So, the very first time I set up for an approach to land on water, I had to do some convincing of myself that landing on water was a GOOD thing! The other thing I quickly realized is that water is not exactly soft. When a plane gets converted to floats, it loses a key component that makes average pilots seem better than they really are…SHOCK ABSORBERS. 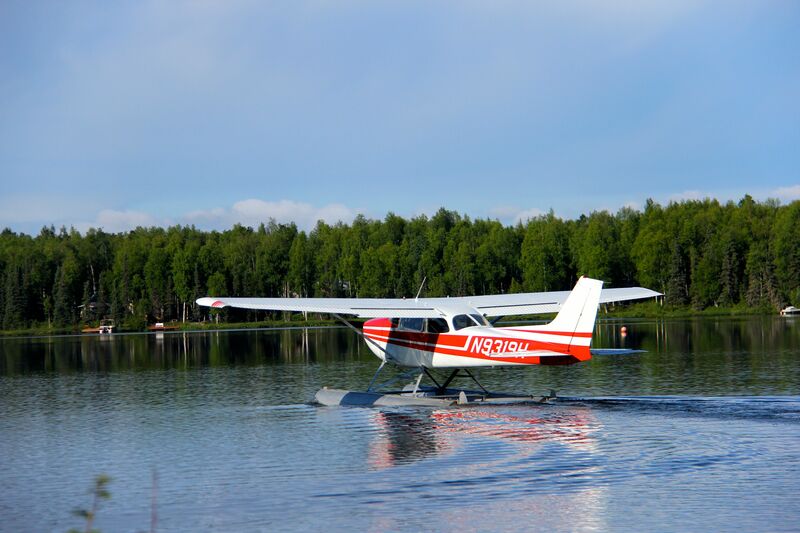 A float plane has nothing to absorb the shock of hitting the water surface except your spine. To say that a “decent” landing could be jarring would be understating the situation. I quickly learned that I had to nail airspeed, sink-rate, and flare if I planned to escape training without a visit to the chiropractor. The more I got used to the plane, learned the nuance of the controls, and nailed airspeeds, the landings progressively got better. Hands down, the most difficult part of the training was maneuvering on the lake. I have a inherent fear of capsizing a boat, and I sure didn’t feel wonderful sitting strapped in the cockpit of vessel designed to fly, not float. I learned this after my check-ride, but apparently the water rudders weren’t as effective as they should have been. The FAA Examiner actually hassled my instructor/aircraft owner about it once we got back from the check-ride. Either way, I never felt completely comfortable doing things like step-taxis (high-speed taxiing on the water) or step-turns (high-speed turns)…it got better the more I did them, and once I learned that the airplane was more stable on the floats than I had originally imagined. I will say that even a small wind can wreak havoc on a plane on floats. The plane is just a weathervane and it wants to face into the wind. Fighting the wind proved to be my biggest frustration. In Part #2, I will give more details of the training & how I almost flunked the check-ride.